Wow! It's Friday again! I can't believe how fast the weeks fly by. And the months! 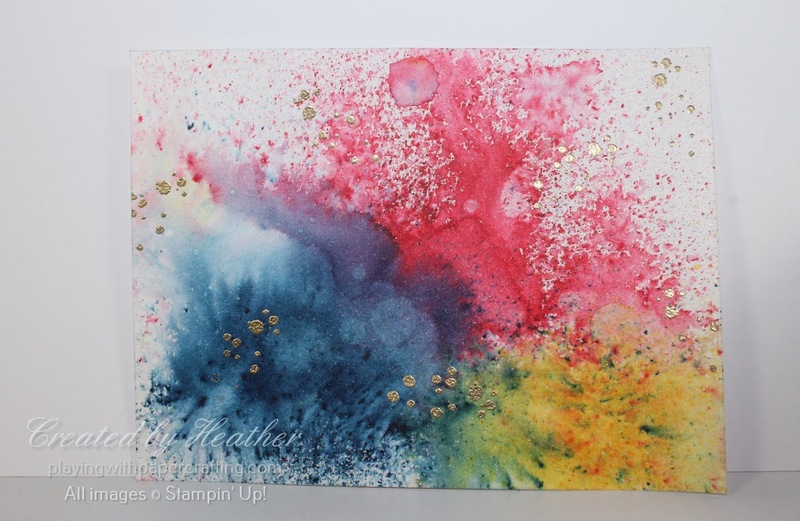 I just completed my monthly newsletter and sent it out yesterday! 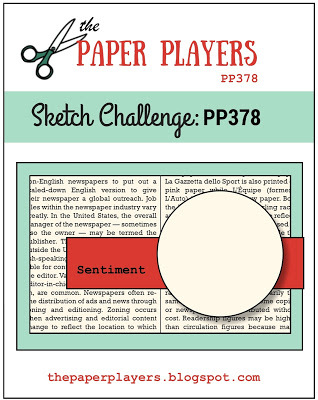 It's always quite a big task for the week, but it feels like I was just doing January's newsletter! At this rate, it's going to be summer before I know it! Wait...What?! That's a good thing, right! Then I worked on the Lots of Lavender image. Knowing that I wouldn't be able to stamp the background colour over the embossed outline because of the emboss resist effect, I had to estimate where to place the colours for the leaves, stem and bow. I wasn't worried if I was a bit out because it's a watercolour effect and it doesn't have to be exact because of that. But when I put everything together, the background was just too much for the image, as much as I loved it. As soon as I pulled it out and left the plain Gold Sheet in behind, I knew that more clean and simple look was the one that needed to happen. That lovely background will have to wait for another more suitable card. 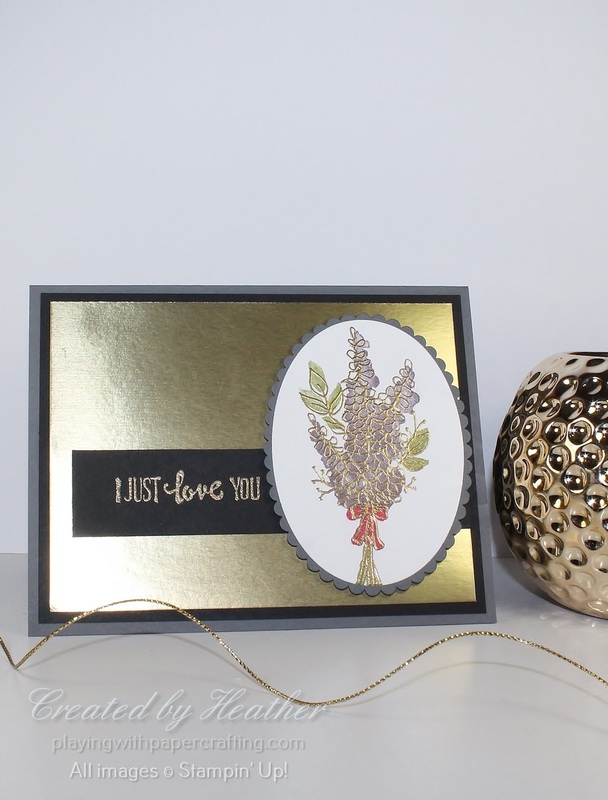 The Basic Gray and Basic Black backgrounds provide a more dramatic and elegant backdrop for the Gold Foil and the embossed Lots of Lavender image. I stamped the lavender flower colours first in Perfect Plum, Old Olive and Real Red. 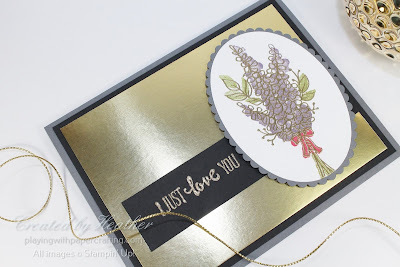 I then stamped the outline over top in Versamark Ink and sprinkled on the Gold Stampin' Emboss Powder, and heat set it. I was pretty accurate in my estimates of where to place the background colour in order to have it match up with the embossed image, seeing as I had to guess. 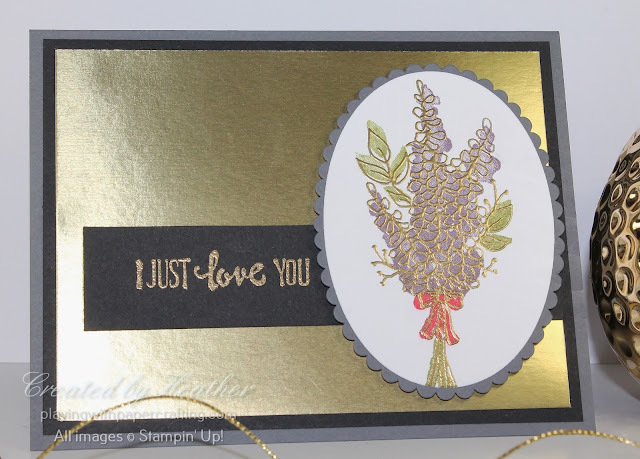 The sentiment is embossed in Gold Stampin' Emboss Powder on a strip of Basic Black cardstock, fitting just underneath the oval shape of the lavender. What do you think I should use the Brusho Background for? 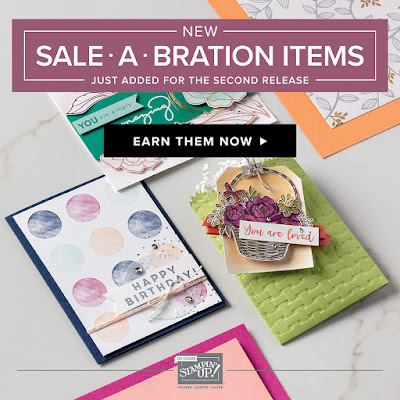 We just got word this week that Stampin' Up! 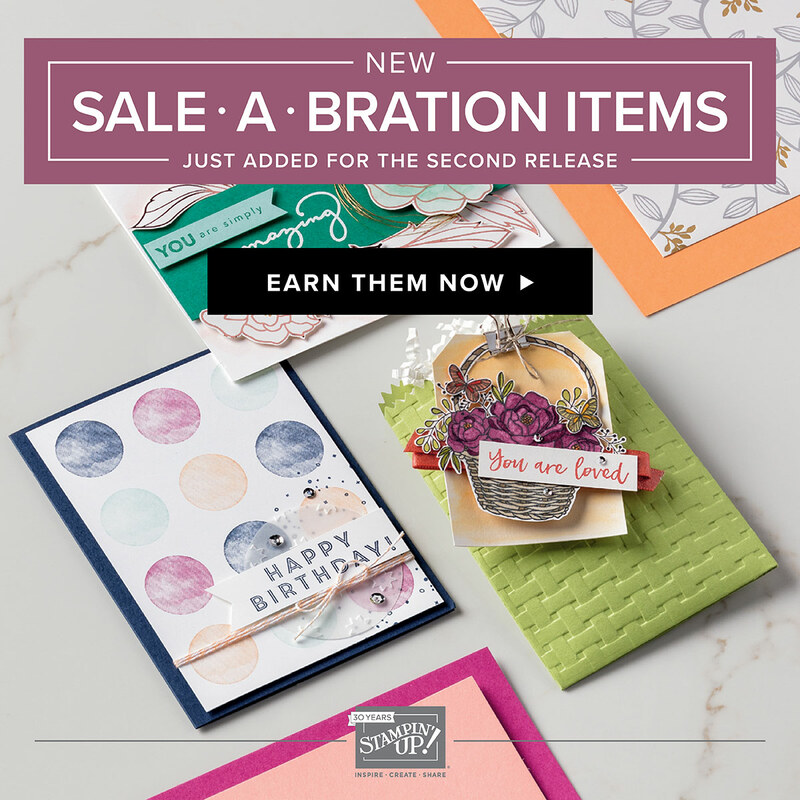 will issue a second release of three new Sale-A-Bration rewards on February 16. Keep watching my blog for further information on these awesome new products, coming your way soon! Well, that's all I have the energy for tonight! Have a wonderful weekend and see you again Monday!